The cathedral was founded in 680 and the present building was begun in 1084. Work continued through to 1504 and represents every style of English architecture from Norman to Perpendicular Gothic. 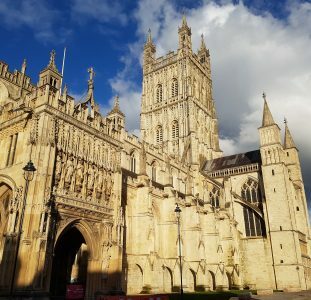 The earliest parts of the cathedral are the Norman crypt begun in 1084 by bishop St. Wulfstan and the circular chapter house of 1120 which was then made octagonal on the outside when the walls were reinforced in the 14th century. The central tower of 1374 is considered to be ‘exquisite’ and is one of the earliest in the Perpendicular style. Charles II is said to have watched the Battle of Worcester from it during the Civil War.